Doctor Neha: Welcome everybody to today’s video blog with Deanna. She’s a brave soul who’s willing to ask her questions so that all of you can learn. So welcome, Deanna. Doctor Neha: What have you been thinking? What have you been thinking about? Deanna: What I’d like to get some help with is how to learn to get out of my head and into my heart. Doctor Neha: Wow, that’s a big one. Tell me how you know you’re more in your head than your heart. Deanna: Well, I believe that I operate up here because of my profession and because of growing up in a family where no one wanted to talk about emotions or how you were feeling. So I felt that I needed to keep them inside—and I’m not addressing them. Doctor Neha: So you notice this mostly from your family; that’s you did things and this is how you still do them. Deanna: Yes, I’m trying to do it differently, but it’s not easy to change. Doctor Neha: And who gives you feedback that you are in your head, not your heart? Does someone give you that feedback or is this something you came up with that you noticed and want to change? Doctor Neha: So it’s a sarcastic way of saying, “When you figure out what’s going on in your heart, let me know.” Are you someone who tends to be more cautious or more spontaneous? Doctor Neha: Does that mean your husband is a little more spontaneous? Doctor Neha: What would you get from being more in your heart? What would it give you? Deanna: More connection. More peace, more of a sense of calm. I wouldn’t always be thinking in planning mode about my next word, my next trip…I’d like to be more in the moment. Doctor Neha: So what you really want is to be present. I’m not sure if being in your heart is going to give you more calmness. When you’re in your heart, you might feel like you’re on a roller coaster ride. Think about little kids. One moment they’re crying and upset, and then they see someone with bubbles and they are excited or curious. So I wouldn’t say that being in your heart means that you’ll be calmer. I do think you can be more present if you’re more in your heart. It sounds like you’re describing that when you are in your head, you may have a lot of worry and anxiety as you’re ruminating over and over. You’re going through scenarios. Then you also described that you miss the moment, like when your husband is saying get back to me in a few days after you figure out what you feel. It sounds like when something is happening right now, clearly Deanna has to think through everything before she gives an answer. Is that kind of what you do? Are you thinking about like the pros and the cons? What’s going on in your head? Because it serves you in some way. Deanna: Well, I think that what happens is if there is some sort of confrontation or conversation that’s uncomfortable for me, I tend to push my feelings out away from me because it’s too overwhelming to confront and address them. It’s easier for me to get in my head and either distract myself with work or with other things that are going on in my life. It’s a way to kind of run away from addressing and confronting those feelings that I’m comfortable. Doctor Neha: All right. So what you’re saying is, “I’ve got this head thing mastered. I’m all over all the different ways of thinking and thoughts.” You’re a doctor so clearly a lot of value comes in for you when you’re problem solving, when you’re in the zone of thought. You’ve mastered that piece of it—in fact, you’ve mastered it so much that you think your way out of feeling. So anything you’re going to feel or anything uncomfortable is going to lead you back into your headspace. However, the interesting thing about being in our heart is that emotions guide us. They’re really the true guidance. When you feel joy or sadness, those emotions let us know if what’s happening around us or the choices we’re making align with what we value. So we have to learn to lean into the discomfort of emotion in order to guide ourselves more quickly. What’s the worst thing that could happen if you were spontaneous and you jumped in and said yes to something? Deanna: I might make a mistake. Doctor Neha: You might not look perfect. And so as physicians, in our world, we face a lot of life and death decisions. So we were taught that we can’t make a mistake. It’s not acceptable. But when you take belief and spread it to every decision—such as do you want to go to dinner tonight at X, Y, or Z?—it’s almost like what you lose is that present moment, that moment of excitement, that moment of spontaneity, that moment of just like letting go and going with the flow. So if you let go, what might happen besides you might make a mistake, then what will happen? Doctor Neha: Is it OK? Does it matter if you look foolish if it also deprives you of the ability to have fun? I’m pretty sure your husband can do some pretty silly things and make himself look foolish and then he laughs it off and keeps going. Is that true? Doctor Neha: It’s really about the messages when you were young. What you were taught around what it looks like to make a mistake and what it is to be foolish. Were you ever made fun of or ever told image mattered more than what was real for you? Or to keep your emotions in check? Is that true? Deanna: Yes, definitely. Basically what my dad said was “You have a wonderful life. You have nothing to be upset about.” He didn’t want to hear I was upset when life was going so well. Doctor Neha: “Don’t show your emotions around here.” Now, do any of your children show their emotions? Doctor Neha: And does that make you uncomfortable? Doctor Neha: Do you tell them to stop doing it? Doctor Neha: These guys are going to be your greatest teachers. What I’d say, Deanna, is that it is time to do one thing spontaneous or silly or playful or present in the moment every day. Do one thing every day, whether it’s waving to a stranger at a stoplight. I don’t care what it is. Do something you think would be silly, ridiculous, something that would not be allowed and doesn’t follow the rules just because you feel like it. Do it to honor whatever’s true for you. Start doing one thing each day where you’re present and you did it just because you felt like it. Can you do that? Deanna: Well, let’s just say that I’ve been thinking about it. Doctor Neha: Of course. What we should do is have you do this for one week and let’s see what happened. Deanna: OK, sounds like a plan. Of course, I’ll do it. Doctor Neha: Of course I know you will because you love homework. Now you have an assignment. You’re a good student. For those of you who you struggle with being in your head too much and are not as comfortable moving into your heart, the important thing to remember is that if you try to contain your emotions, you can’t just stifle the ones that have you feeling bad, mad, sad. You can’t shut those down without also decreasing your ability to feel joy, excitement, and peace. It’s like an amplitude wave that goes up and down—you can only feel as much as you’re willing to feel on both sides. So if you stifle emotions, you limit your capacity for joy and happiness and exuberance. 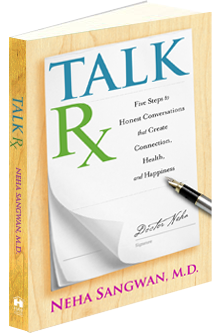 In my book TalkRx, I have five chapters on emotions, including anger, anxiety, and tears, and how they work. Those will be a good place for you to start. So thank you, Deanna. What were your takeaways? Deanna: What you just said made so much sense, about how trying to stuff the bad emotions ends up in you stuffing all emotions and it’s really limiting the bandwidth of feeling. And I do notice that I want to change that. Thank you so much. I’m excited to have my week of doing something silly and fun every day. Doctor Neha: Awesome. Thanks for being with us, Deanna. Take care. 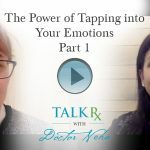 Refer to the emotional vocabulary list (p. 136 of Talk Rx), and place a check next to the emotions you experience most commonly. Which emotions are comfortable? Which ones are uncomfortable? When you feel an uncomfortable emotion, get curious about the physical sensations that let you know what you’re feeling? Pause. Soften your abdomen and take three slow, deep breaths. Practice expressing the emotion to someone you feel safe with. Just say how you feel without needing to analyze it. As you breathe through it and say it out loud, notice if the physical sensations shift.